My second baby Ben is approaching his first birthday. For me it feels a bit like I deserve a graduation ceremony for passing the baby phase for the second and almost certainly final time. For me, year one for each of my babies were probably the hardest of life. Neither were particularly difficult babies and there were no significant dramas – this is definitely a case of it’s not them, it’s me. I am now more than happy to admit that my cute, blue eyed little hair bears just terrified me to my very core. I can’t count the number of times a mum has advised me to enjoy the baby bit; “because before you know it they’ll be running around”. I’ve always nodded enthusiastically whilst secretly thinking how much I REALLY want to get to that running around bit. In my mind if they can run then all I really have to do is catch them and I’m darn sure I’ll be able to run faster (for the next 10 years at least). I’ve thought so much about why it has been so hard for me. It’s certainly not a bonding issue. I was head over heels in love with both the little monkeys the second I knew they were in my belly. Both of them have been nothing short of utterly mesmerising to me from the minute they arrived. I look back at photos of them pretty much on a daily basis. Cumulatively in both their first years we’ve had 5 professional photo shoots, I have their foot and handprints in silver, clay and on Christmas baubles. Each of them has a fully completed “Baby’s First Year” book and each has enough blogs and magazine articles written about them to embarrass them throughout their teens. Was it the major life upheaval? Was it lack of sleep? Hormones? Am I just not maternal? I know so many mums who just rock the baby phase. They love every second and mourn its passing. I’m in awe of them. For me though, the whole thing was just, well, enormous. Firstly, you realise when you become a mum that all the adverts, book covers and packaging photography of babies are actually not “baby babies” at all. When you see an image of a podgy little cherub in a high chair wielding a spoon, sprouting a couple of little bottom teeth and giving you a cheeky wink, it’s likely that baby is approaching its first birthday. A real live actual baby is about the size of THAT baby’s left leg. It can’t see, it can’t digest, let alone hold food, it can’t smile and it doesn’t even know it has arms! Then, there’s the responsibility of protecting something that helpless, coupled with the unfeasibly ridiculous amount that you instantly love them. It rendered me almost incapable of breathing. I barely slept for the first years of each of my baby’s lives. Ironically, they did! I remember describing one of my nights to a friend; “yeah finally got to sleep at 11, woke at 2, then 3.30, then woke up for good at 5”, they looked at me sympathetically and told me the baby would start sleeping through soon enough. The baby had been sleeping through for the past 3 months. For me though, the clichés were all true. It did get easier. There is a point in time when my mummying mojo arrives and that is somewhere around the 10 months mark. I remember the moment with Holly. She turned that age just as it turned summer and I distinctly remember coming back to life. I remember giggling our heads off at rhyme time at the local library, playing on swings, feeding ducks, taking her to her first friend’s birthday party and just loving every second. No fear, definitely not all perfect but mostly just joyful. Only this last week, I had my turning point moment with my little Ben. We were sat in a coffee shop waiting for Holly to finish her gymnastics class (look how far SHE’S come!). We were playing mock battles with plastic coffee stirrers and both laughing our heads off. I lifted him out of the high chair and held him up in front of me, he stared right at me and moved in for what might have been a kiss, a bite or simply to soothe his teething gums on my cheek, but he looked me straight in the eye, held my gaze and didn’t stop smiling. At that moment the whole world melted away. It was just me and my gorgeous, perfect little boy. I realised I wasn’t scared anymore. And so now, my baby phases are near enough complete. I know there may be trouble ahead – another round of terrible twos (threes and a couple of fours), school, teen rebellion etc. but bring it on. I’m not scared, just up for it and ready. So go on my little munchkins, you run.. and I’ll catch you. Always. Contributed by our guest blogger Jackie Wilson. Jackie has worked extensively in marketing for brands including Twinings, Del Monte, Kingsmill and Cathedral City. She is now living the ex-pat dream in Malaysia. 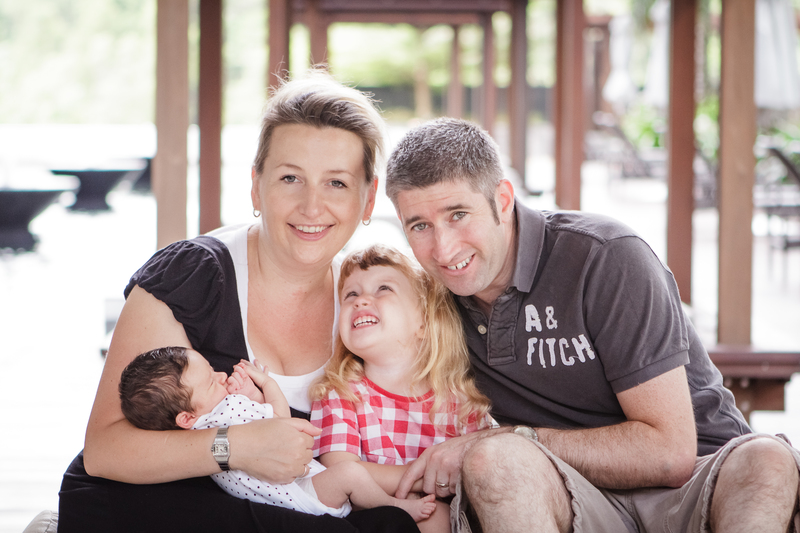 She’s mum to two lovely children and is combining looking after them with some freelance writing, most recently for Bonda, the magazine for Malaysia’s equivalent of the NCT and ABWM Mag (Association of British Women in Malaysia). Her Malaysian journey is chronicled in her blog at http://www.malaysiamummy@wordpress.com or if you’d like to get in touch she can be found at Jackie.wilson71@gmail.com. This entry was posted in Guest Bloggers, Mama observations and tagged Jackie Wilson, Motherhood, new borns on March 4, 2014 by jennysyd. The second baby…..twice as nice or double the trouble? The Birth: I don’t think I’ve met a single mother who’s second birth story was worse than her first. For me, whilst the second took longer it was undoubtedly easier. The first time round the mounting contractions scared the wits out of me. It’s when they start to get towards the ouchy stage and you have absolutely NO IDEA of how much more painful they are gonna get, that it messes with your head. With my first (Holly), 2 hours in I was in a blind panic thinking Owwwwwww! This is my limit!.. Help me!…… DRUUUUGS!! In actual fact, half an hour later, little Miss Holly was lying on my chest and it was all forgotten. Therein lies the rub…. when number 2 is knocking at the exit door you know EXACTLY how bad it’s going to get…and most importantly, you know you can cope, you know that you forget and you know its utterly, utterly worth every second. Letting go of your pre-baby lifestyle: Second time round this is painless, because it’s quite simply already gone. With number 1, I think it takes a good couple of weeks to realise that life as you knew it has pretty much packed its bags and gone to live in Australia (at least for a gap year). By the time number 2 comes, life as you knew it has been torn down and rebuilt – and yep it’s better. You only ever really look back nostalgically – you don’t really want to go back there. Shopping: First time round, for me, it was like – WOW there’s an entirely new sector of shopping malls that are now relevant for me. PARTY ON! I bought bottle warmers, singing sheep, bath liners, hundreds of baby gros (sleeveless, short sleeved, with pattern, without pattern, with sleeves but no legs…blah, blah), shoes etc etc. By the time your first baby is 1, you discover just how much stuff you never used. Up to 12 months, baby clothes expire in size every 3 months (or less). You could make a marquee out of the unused babywear from baby 1. Second time round, you just know. And by the way, until they walk, babies really don’t need shoes (and that includes Hunter wellies and baby Havaianas, but then you should still buy them coz they’re cute). Other things that are easier include: dealing with nappies, curing nappy rashes (Sudocrem! ), coping with little sleep and bathing baby (you’ve learned how robust they are and that having spent 9 months in water they are kind of at home there). Pregnancy: Whilst any pregnancy comes with its own unique cocktail of aches, pains, nausea and ad hoc afflictions, the second is harder because, both to yourself and to others, you’re simply not as special. You friends have seen what you look like as a weeble, you don’t have enough time to hang around looking serene and magical and your parents are distracted by the gift you have already given them. Second time round, its less a celestial experience, moreover a 9 month wait with cumulative discomfort (AND with a little being tugging at your leg asking for chocolate and Peppa Pig on the Ipad). Getting anywhere by car: I once plotted a process flow chart for getting 2 children somewhere by car. It blows your mind. Travel systems, buggy clips, safety harnesses, car seats, wrapping seat belts round car seats, all with an overlay of high pitched wailing and protestations. Sometimes you will just stay at home. Weight loss: I seem to remember that at about 6 months after Holly was born I was near enough back at my pre-baby weight (albeit with a softer belly). I’d not done much really to get there. I was back running (slowly and not far), whilst eating a lot more cake. This time round at the same stage I’m still about the same weight I was when Holly was still in there. I guess I must just be eating bigger cakes. Illnesses: Whilst you may not panic as much, having a sick baby is always horrible. Even though you know about “the glass test”, any rash will stop your heart, cries in the night will jump start your heart and the sad face of a sick baby will break your heart. No experience changes that. Dig in. Baby weight gain tracking: There is something about percentile charts that are designed to unnerve. Whilst Holly was not that interested in food and it was all about getting some pounds on, with Ben I’m obsessed with his length (10th percentile.. but head is 50th… will he balance??). Percentiles simply make you think too much. Multiple, random, daily guilt trips: If you’re a mother and you don’t feel guilty about something, well… you should …errrr probably just feel a little bit guilty about that! And finally, and of course the most important thing……………..
How much you love them. There will always be something special about your first baby. The same way there is something special about your first kiss, your first car, your first…well, you know – everything. The thing with second babies however, is that whilst the experiences are happening for the second time, it’s still the first time you’ve met this particular little human. That’s where its heart stopping, earth moving, life affirming magic all over again. Contributed by our guest blogger Jackie Wilson. Jackie has worked extensively in marketing for brands including Twinings, Del Monte, Kingsmill and Cathedral City. She is now living the ex-p at dream in Malaysia. She’s mum to two lovely children and is combining looking after them with some freelance writing, most recently for Bonda, the magazine for Malaysia’s equivalent of the NCT and ABWM Mag (Association of British Women in Malaysia). Her Malaysian journey is chronicled in her blog at www.malaysiamummy@wordpress.com and if you’d like to get in touch she can be found at Jackie.wilson71@gmail.com. This entry was posted in Guest Bloggers, Mama observations and tagged ABWN Mag, Bonda, Jackie Wilson, Malaysia, Second Baby on October 2, 2013 by jennysyd.